Honda’s achingly gorgeous CB1100R, first shown as a 2007 concept, is still a live project if freshly-filed patents are anything to go by. Concept bikes usually have a short life. They’re watered-down and fast-tracked to production or they’re mothballed in a darkened warehouse. But occasionally the idea they represent lingers on even though there’s no instant rush to production. 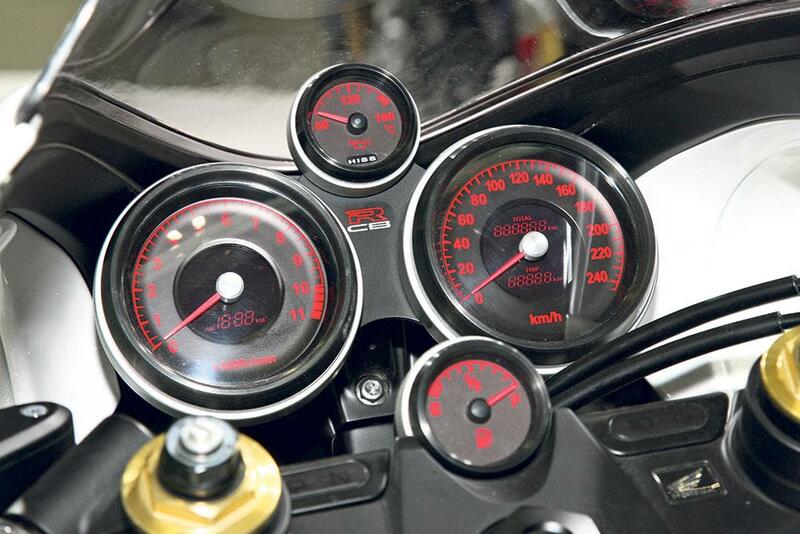 That seems to be the case with the CB1100R concept, first shown in Tokyo back in October 2007. While its sister machine, the CB1100F which was revealed alongside the R, was rushed into production, appearing as a second-generation concept in 2009 and reaching showrooms the following year, the sexier single-seat R version failed to make further progress. However, rumours from Japan and a flurry of new patent applications suggest that the idea of an air-cooled, retro-styled sportsbike is still alive and kicking at Honda. 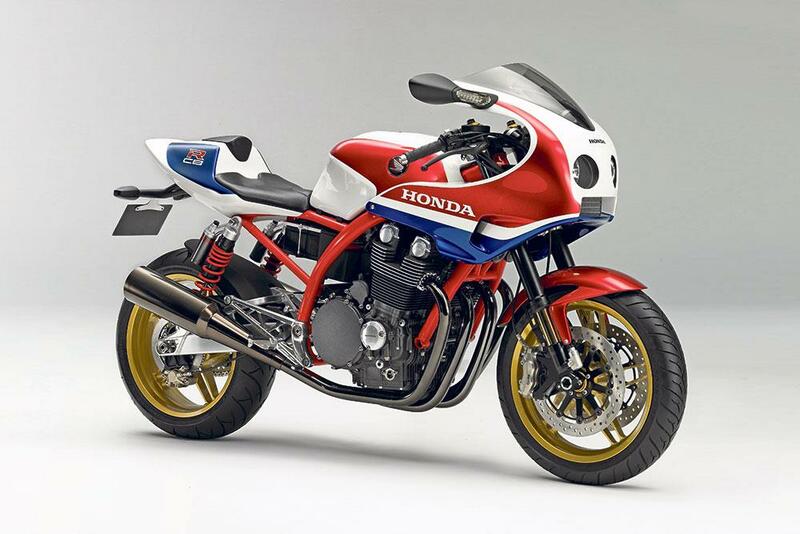 These rumours are bolstered by the fact that Honda have seemingly committed to keeping the CB1100 in production for the foreseeable future, revealing an updated version as the ‘CB1100 Concept’ at the 2015 Tokyo Show (see below) and making assurances that the CB1100 will be able to meet Euro4 rules that will apply to all new motorcycles registered in Europe from January 2017. The latest development, just published by the Japanese patents office, specifically relates to the challenges brought by adding a fairing to the air-cooled CB1100. In particular it deals with the issues of getting enough air to the sensitive area around the spark plugs. While this isn’t a big problem for water-cooled bikes, which can place their radiators anywhere and use a constant flow of cooling water to ensure stable temperatures even within the hottest parts of the engine, air cooling provides unique challenges. The CB1100’s solutions to the cooling issues range from oil-cooling the spark plugs to intricately modelled airflow over fins that are carefully designed to maximise their cooling potential. So understandably, whacking a fairing over the top and disrupting that airflow isn’t a move to be taken lightly. The new patents show how the designers are ducting air from the intakes on either side of the proposed fairing, channelling the airflow to the spark plug area and distributing it as evenly as possible across the hottest parts of the engine. The ducts themselves also double as fairing stays. Although not specified on this patent, the original concept’s oil-cooling solution, where the oil cooler was mounted below the headlights in the front of the fairing rather than behind the front wheel, also makes sense in terms of combatting the loss of airflow caused by the half fairing. 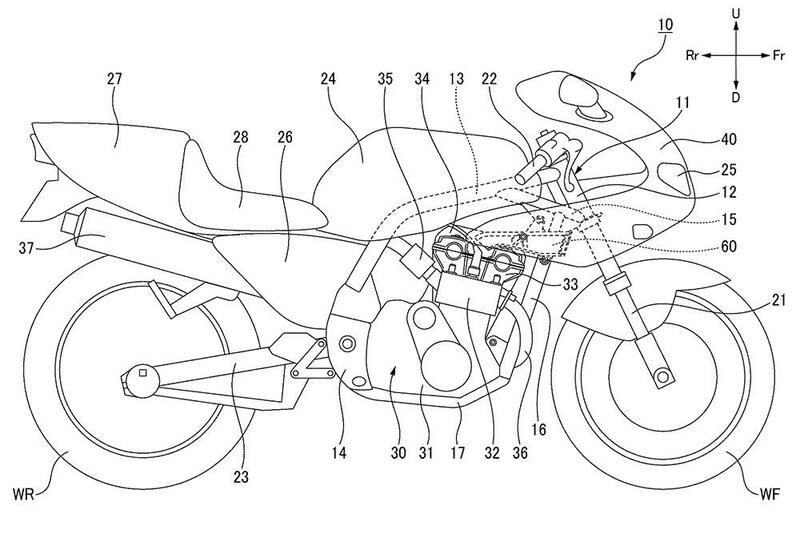 Like the original CB1100R concept, the new patents suggest the bike would feature a different chassis. The CB1100R concept lacked the cradle element of the CB1100F’s frame, using the engine as a stressed section instead. This patent takes the modernity a step further, showing a swingarm that appears to be designed with bracing for a monoshock rear suspension, and clearly lacking the twin shocks of the original concept. The man behind the Honda CB1100 road bike told MCN that he would fight hard to get the CB1100R into production; maybe now his dreams are coming true. 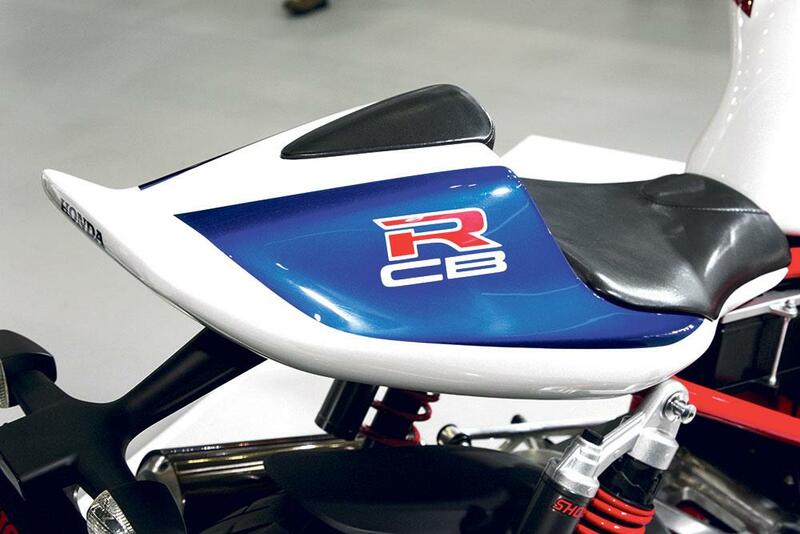 Chief Engineer Hirofumi Fukanaga was responsible for several evolutions of the CBR600RR and Fireblade, but the air-cooled CB1100 was a new project from the ground up.